The Rev. 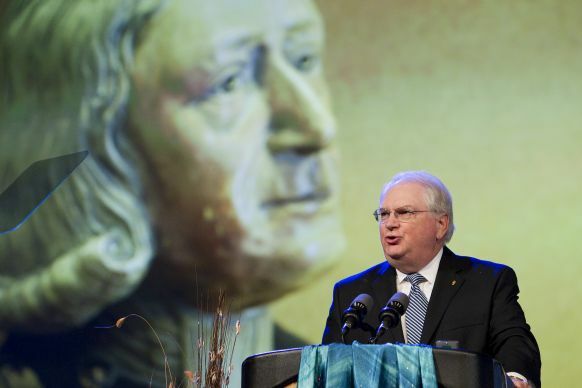 Robert J. Williams, backed by a video image of John Wesley, discusses the work of the United Methodist Commission on Archives and History during the denomination's 2012 General Conference in Tampa, Fla. Williams retires Aug. 1, 2014. For as long as he can remember, the Rev. Robert Williams has been passionate about God, history and the Jersey Shore. A United Methodist pastor in New Jersey since 1970, Williams has been both a student and teacher of church history. He was ordained an elder in 1974. Now, he is retiring — effective Aug. 1 — after nine years as the top executive of the United Methodist Commission on Archives and History at Drew University in Madison, N.J.
One of the benefits will be spending more time at his home in Ocean City, where nothing is better, he says, than strolling the beach or having a backyard dinner with friends on a gorgeous summer night. Founded as a Methodist camp meeting in 1879, Ocean City is the place that binds his faith and the rest of his life together. It’s a town where the church’s roots are so deep, William notes, that alcoholic beverages still are not sold in public places. Last year, he had the privilege of preaching at St. Peter’s United Methodist Church there to mark the 50th anniversary of his joining the church. He met his wife of 44 years, Renee, on the beach in Ocean City, when he was 19 and she was 18. His two daughters and three grandchildren spend time at their Ocean City duplex. “I’ve been returning to Central Avenue in Ocean City at least every summer my whole life,” he says. Just as important to him as the memories of those summers are the memories of The United Methodist Church, which, he believes, help guide the denomination’s present and future. “Without our memory, the church can’t be the church,” Williams declares. For Williams, books were as much of a draw as the beach in those early days. He was fascinated by American history, even though he made the decision not to pursue it as a vocation. “In college, I majored in math and science because my dad said, ‘Math teachers get jobs; history teachers don’t,’” he explains. But his plans to teach high school chemistry — he earned a master’s degree in education from the University of Pennsylvania in 1970 — did not materialize once he decided to go to seminary. He earned his master of divinity degree from Eastern Baptist Theological Seminary in 1973. As the top staff executive of the denomination’s archives, Williams often is asked to provide a historical context to churchwide issues and debates. Williams and the archives staff have worked hard to expand their resources on the denomination’s Central Conferences outside the United States. Part of the historical context for the current struggles as United Methodists try to live into being a global church, Williams says, is the fact that the central conferences grew out of the missionary movement and then became indigenous churches. Williams will be succeeded at the Commission on Archives and History by the Rev. Alfred T. Day III, pastor of historic St. George’s United Methodist Church in Philadelphia.